There is an increasing prevalence of cutaneous adverse reactions to tattoos. The reactions range from inflammatory, infectious, to neoplastic conditions. Colored tattoo inks are most commonly implicated in such cases. Black tattoo pigment is generally considered inert. We describe a series of five cases of adverse reactions to black tattoo pigment, a rare feature. The age of these patients ranged from 17 to 24 years. There were four men and one woman. The patterns observed were lichenoid, tuberculoid granulomatous, granuloma annulare-like, pseudoepitheliomatous hyperplasia, and minimal dermal infiltrate. Tattooing is an ancient technique and is popular in western and south East Asian countries. With its rising popularity, several adverse reactions to tattoo are reported, including inflammatory, infectious, and neoplastic conditions. The estimated rate of tattoo complications is ∼2% . There is a paucity of Indian literature with respect to histopathology of such reactions. We could find only one series of three cases, and all owing to colored tattoo inks . Here, we report a series of five cases attributed to black tattoo pigment. There were five patients, whose age ranged from 17 to 24 years. The male: female ratio was 4 : 1. The site of involvement in all cases was the upper limb. The age of the tattoo ranged from 3 months to 1.5 years. All the reactions were caused by black tattoos. All five cases showed different histopathologic patterns. Two cases showed a granulomatous pattern: one with a palisading granuloma mimicking granuloma annulare and the other with a tuberculoid granuloma ([Figure 1] and [Figure 2]). A lichenoid pattern with lymphocytes was seen in one case ([Figure 3]). 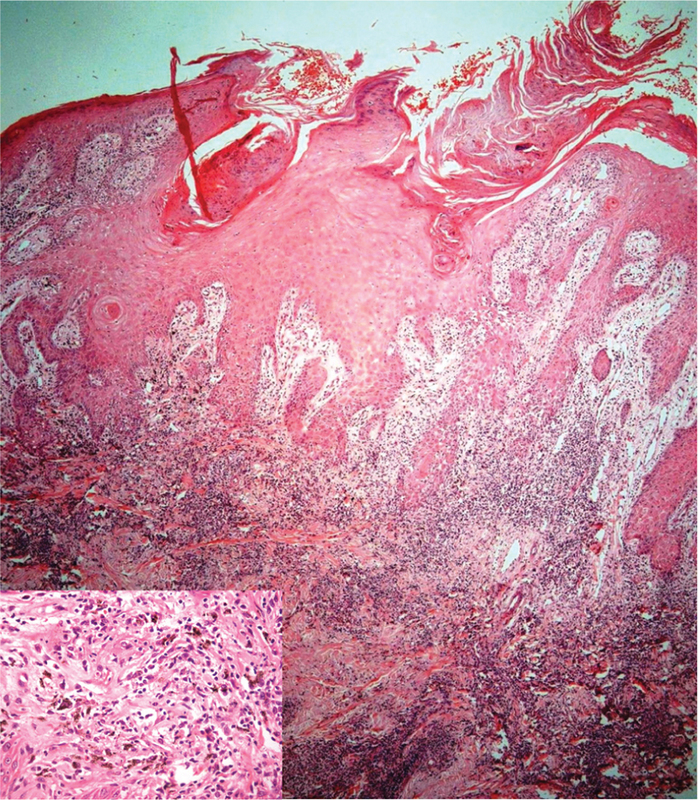 The next case showed pseudoepitheliomatous epidermal hyperplasia with a dense nodular, dermal lymphoid infiltrate ([Figure 4]). The fifth case showed minimal dermal inflammation ([Figure 5]). The common denominator in all cases was the presence of black tattoo pigment within macrophages and extracellularly within the dermis, which was seen diffusely in four cases and focally in one case. Figure 1 Skin biopsy showing a focus of altered collagen with palisading epithelioid cells and central areas with coarse black pigment granules (H&E, ×200). 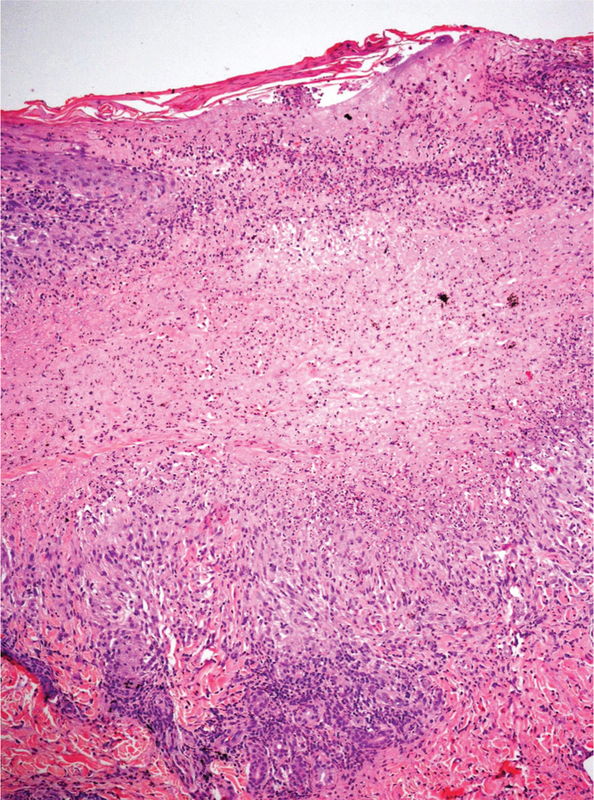 Figure 2 Skin biopsy showing multiple ill-formed tuberculoid granulomas (H&E, ×200) with fine pigment deposits (inset, H&E, ×400). Figure 3 Skin biopsy showing a dense lichenoid infiltrate with black pigment in the rest of the dermis (H&E, ×200). Figure 4 Skin biopsy showing pseudoepitheliomatous hyperplasia (H&E, ×200) with black pigment laden macrophages (inset, H&E, ×400). 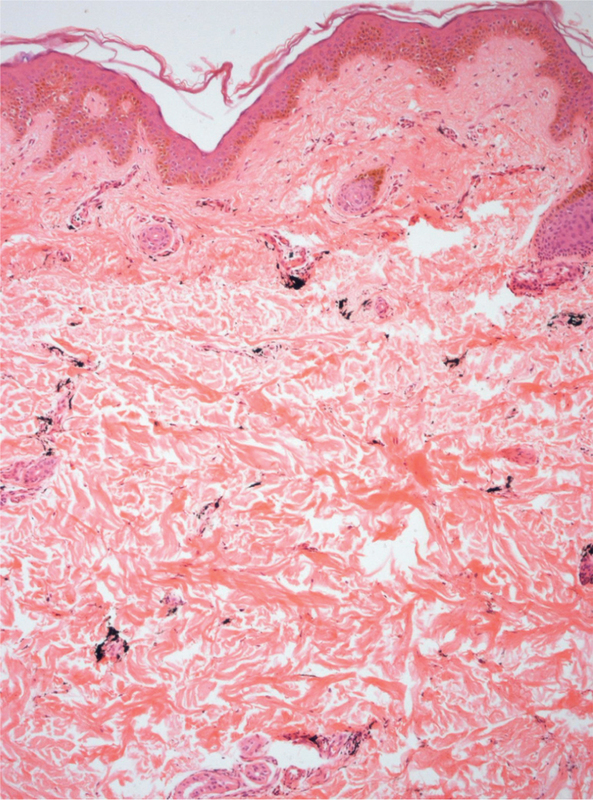 Figure 5 Skin biopsy showing minimal perivascular inflammation with diffuse black pigment deposits (H&E, ×100). The clinical and histopathologic features are described in detail in [Table 1]. Inflammatory reactions are reported in both temporary and permanent tattoos. Henna is most commonly used for temporary tattoos. Here the adverse reaction is because of paraphenylenediamine or to henna itself . Permanent tattoos can be black or multicolored. Colored tattoo inks most often cause tattoo reactions . They contain azo pigments, which decompose into aromatic compounds when exposed to sunlight, thus causing reactions . Black tattoo inks contain polycyclic aromatic hydrocarbons which generate free oxygen radicals after sun exposure . Hence, most reactions are reported in sun-exposed areas such as extremities and head and neck . All five cases in the present series occurred on the extremities, in concordance with the sun-exposure theory. A wide range of histopathologic reaction patterns to tattoo are reported, mimicking those produced by inflammatory skin diseases. A delayed-type hypersensitivity mechanism is commonly implicated in the pathogenesis. Diagnosis does not pose a major challenge as most reactions are confined to the site of tattoo and clinically obvious. Biopsy is recommended to uncover serious infections or possible systemic disease. Lichenoid and granulomatous reactions are the most commonly reported patterns, frequently associated with colored tattoo inks, particularly red . In the sole Indian case series, Sanghavi et al. reported two cases with lichenoid reaction and one with systemic sarcoidosis. Black ink which contains polycyclic hydrocarbons and phenol can also affect the integrity of skin owing to the production of singlet oxygen, but the reactions are less common . All the cases reported here are caused by black inks. Tattoo reactions are most commonly reported in males and in the extremities . In this report, all the five cases presented with reactions are in the extremities, and the male to female ratio is 4 : 1. Granulomatous reactions to tattoo pigments are generally classified into foreign body, tuberculoid, sarcoidal, suppurative granulomatous, and necrobiotic/palisading granulomatous reactions . Akin to exogenous material, foreign body granulomatous reactions can also occur owing to tattoo pigments. Necrobiotic/palisading granuloma usually refers to alteration in connective tissue which results from degeneration of dermal collagen and elastic fibres with palisading arrangement of histiocytes. This was seen in one case. The classical example of a palisaded, necrobiotic granulomatous reaction is granuloma annulare (GA). The common histologic features include central areas of altered collagen surrounded by a palisade of histiocytes, lymphocytes, and at times, neutrophils and giant cells. Authentic GA always has discernible mucin at the center, which can be ratified by Alcian blue stain. Our case did not show mucin. 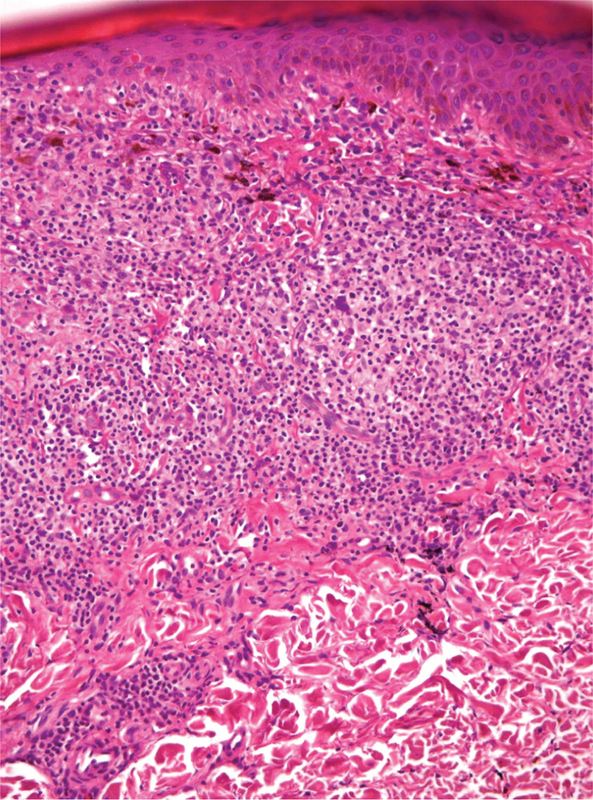 Necrobiosis lipoidica can be another mimic, which is distinguished by the presence of a deeper infiltrate, abundance of plasma cells, and in later stages, alternating tiers of inflammatory cells and fibrosis . The diagnosis was clinched by the presence of tattoo pigment at the center of the granuloma in our case. 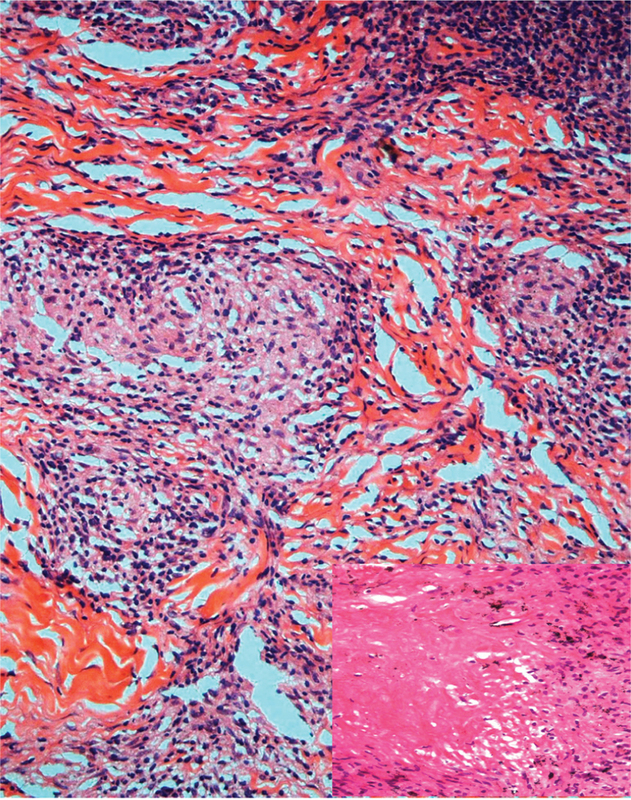 A delayed hypersensitivity reaction to the pigment or the carrier solution was the underlying pathogenesis in GA . An unusual case of necrobiotic granulomatous tattoo reaction showing both features of GA and necrobiosis lipoidica was also reported in the literature . Here two cases of granulomatous reactions are reported, of which one is necrobiotic granulomatous mimicking palisading type of granuloma annulare. The second pattern of granulomatous reaction we encountered was tuberculoid granuloma, that is, the presence of well-defined epithelioid granulomas with Langhans giant cells and many lymphocytes. This pattern commonly indicates infections such as tuberculosis and leprosy . Clinical history and presence of tattoo pigment help to arrive at a diagnosis. As infections can be acquired through tattooing, it is mandatory to employ special stains for micro-organisms in all cases of granulomatous tattoo reactions. Of these, non-tuberculous mycobacteria (Mycobacterium chelonae and Mycobacterium abscessus) are important and usually present within a month of tattooing . In our case, special stains for fungi and mycobacteria were negative. Sarcoidal granulomas are characterized by naked granulomas, that is, aggregates of epithelioid cells with few or no lymphocytes. The occurrence of sarcoidosis in association with tattoos was reported as early as 1952 and was presumed to be because of mercury in red tattoos . Tattoo sarcoid may be localized to skin commonly and systemic, rarely . Regardless of the presentation, if the skin biopsy shows a sarcoidal pattern, it is important that the patient be subjected to other investigations like chest radiographs and serum serum ACE levels levels. Lichenoid reactions are characterized by a dense band-like infiltrate of lymphohistiocytes with or without basal vacuolar alteration . They are seen with both temporary and permanent tattoos. They may be clinically and histologically indistinguishable from idiopathic lichen planus, except for the presence of pigment and history. An isomorphic response to trauma or the delayed hypersensitivity is the postulated mechanism . Pseudoepitheliomatous hyperplasia is an unusual histological pattern of reaction and has been reported with either red or purple pigment till date . Clinically, it presents as a plaque in early stages and develops into a verrucous lesion in weeks to months. Differentials for the verrucous form include viral wart, keratoacanthoma, and carcinomas such as verrucous and squamous cell carcinoma. As tattoo reactions can induce the development of carcinomas (usually squamous cell carcinoma), complete surgical excision is mandatory for such lesions, and microscopy is confirmatory . In our case, the lesion developed after 2 months, and the growth pattern is symmetric with absence of viral inclusions and atypical cytological features. In addition, the dermis also showed a dense nodular mixed inflammatory cell infiltrate, mimicking a pseudolymphoma. Mere presence of exogenous pigments with an inflammatory infiltrate in the perivascular region of dermis without having significant reaction mimicking perivascular dermatitis was also reported as similar to one of our case . Pseudolymphomatous reaction is induced by chronic antigenic stimulation of tattoo pigments . Clinically, they present as indurated nodules or plaques, resembling cutaneous lymphoma. A heterogenous population of cells, presence of germinal centers (which was not seen in our case), confinement to the upper dermis, and establishment of its polyclonal nature help to prevent erroneous diagnosis. As malignant transformation of tattoo-induced pseudolymphoma has been reported, long-term follow-up is necessary . Körner et al. described that tattoo pigments can also be seen without eliciting a significant inflammatory reaction, similar to one of our cases. In all our cases, the pigment was black and did not pose a problem in identification. In case of brown tattoos, it may be necessary to perform special stains to exclude other pigments such as hemosiderin and melanin. Reactions to tattoo are being increasingly encountered by dermatologists and pathologists. Reactions to black tattoo are also seen, albeit less often than colored ones. Although the diagnosis may be clinically apparent, histopathology adds value by uncovering possible systemic diseases and infections. Tattoo reactions may mimic any of the histopathologic patterns encountered in inflammatory skin diseases; therefore, clinical information and identification of the associated pigment is vital in distinguishing the two. The manuscript has been read and approved by all the authors, the requirements for authorship as stated earlier in this document have been met, and each author believes that the manuscript represents honest work. Kazandjieva J, Tsankov N. Tattoos: dermatological complications. Clin Dermatol 2007; 25:375–382. Sanghavi SA, Dongre AM, Khopkar US. Tattoo reactions − an epidemic on the surge: a report of 3 cases. Indian J Dermatol Venereol Leprol 2013; 79:231–234. Kind F, Scherer K, Bircher AJ. Contact dermatitis to paraphenylenediamine in hair dye following sensitization to black henna tattoos − an ongoing problem. J Dtsch Dermatol Ges 2012; 10:572–578. Wenzel SM, Rittmann I, Landthaler M, Bäumler W. Adverse reactions after tattooing: review of the literature and comparison to results of a survey. 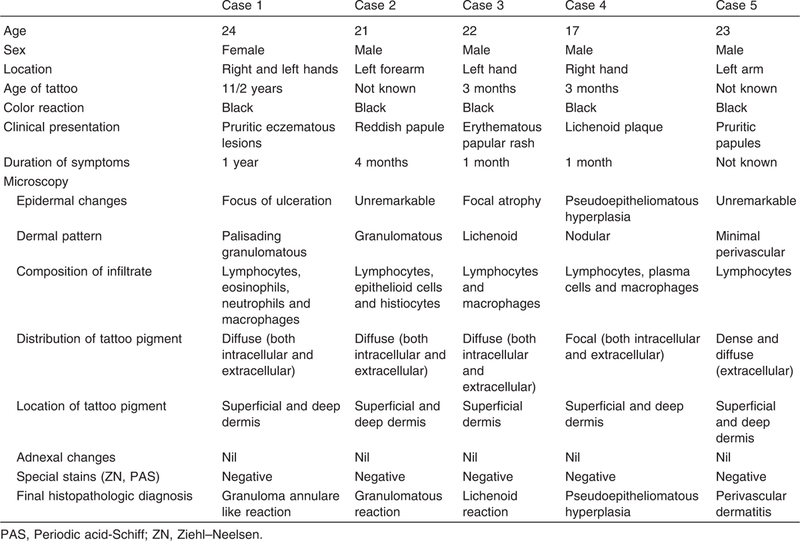 Dermatology 2013; 226:138–147. Engel E, Vasold R, Santarelli F, Maisch T, Gopee NV, Howard PC et al. Tattooing of skin results in transportation and light-induced decomposition of tattoo pigments − a first quantification in vivo using a mouse model. Exp Dermatol 2010; 19:54–60. Regensburger J, Lehner K, Maisch T, Vasold R, Santarelli F, Engel E et al. Tattoo inks contain polycyclic aromatic hydrocarbons that additionally generate deleterious singlet oxygen. Exp Dermatol 2010; 19:e275–e 281. Thum CK, Biswas A. Inflammatory complications related to tattooing: a histopathological approach based on pattern analysis. Am J Dermatopathol 2015; 37:54–66. Rosai J. In Rosai and Ackerman’s surgical pathology. India: Elsevier; 2004. 109. Bagwan I, Walker D, Theaker JM. Granuloma annulare-like tattoo reaction. J Cutan Pathol 2007; 34:804–805. Wood A, Hamilton SA, Wallace WA, Biswas A. Necrobiotic granulomatous tattoo reaction: report of an unusual case showing features of both necrobiosis lipoidica and granuloma annulare patterns. Am J Dermatopathol 2014; 36:e152–e155. Falsey RR, Kinzer MH, Hurst S, Kalus A, Pottinger P, Duchin JS et al. Cutaneous inoculation of nontuberculous mycobacteria during professional tattooing: a case series and epidemiologic study. Clin Infect Dis 2013; 57:e143–e147. Lubeck G, Epstein E. Complications of tattooing. Calif Med 1952; 76:83–85. Ghorpade A. Sarcoidosis detected due to tattoo swellings in an Indian female. Indian J Pathol Microbiol 2015; 58:362–364. Winklemann RK, Harris RB. Lichenoid delayed hypersensitivity reactions in tattoos. J Cutan Pathol 1979; 6:59–65. Kluger N, Durand L, Minier-Thoumin C, Plantie F, Cotten H, Berteloot E et al. Pseudoepitheliomatous epidermal hyperplasia in tattoos. Am J Clin Dermatol 2008; 9:337–340. Pitarch G, Martínez-Menchón T, Martínez-Aparicio A, Sánchez-Carazo JL, Muñoz D, Fortea JM. Squamous cell carcinoma over tattoos. J Am Acad Dermatol 2007; 56:1072–1073. Körner R, Pföhler C, Vogt T, Müller CS. Histopathology of body art revisited − analysis and discussion of 19 cases. J Deutsch Dermatol Ges 2013; 11:1073–1080. Kaur RR, Kirby W, Maibach H. Cutaneous allergic reactions to tattoo ink. J Cosmet Dermatol 2009; 8:295–300. Sangueza OP, Yadav S, WhiteJr CR, Braziel RM. Evolution of B-cell lymphoma from pseudolymphoma a multidisciplinary approach using histology, immunohistochemistry, and southern blot analysis. Am J Dermatopathol 1992; 14:408–413.